Hanoi (VNA) – Young legislators from Vietnam and Japan met in Hanoi on August 22 to share experience in their work and discuss regional and global issues of common concern. 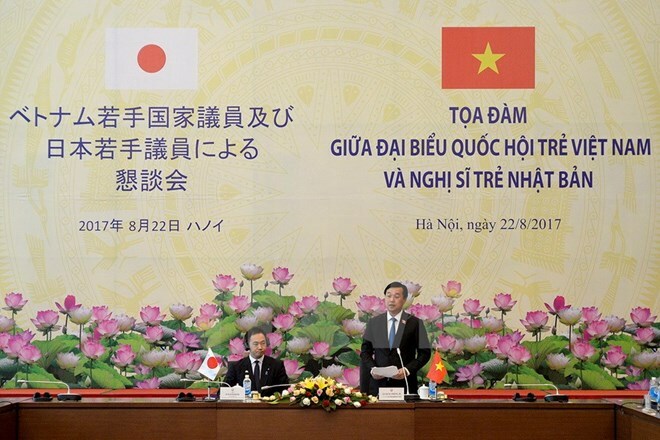 At the meeting, Chairman of the Group of Vietnam’s Young National Assembly Deputies Le Quoc Phong said the regular organisation of exchange activities between the two countries’ parliaments will help youngsters better their understanding of Vietnam-Japan sound relations, thus contributing to developing the bilateral rapports at present and in the future. The event creates an opportunity for the Vietnamese and Japanese young parliamentarians to show friendship and raise their responsibilities for important issues in their nations as well as in the Asian-Pacific region, he added. Keisuke Suzuki, head of the Youth Division of Japan’s Liberal Democratic Party, said the two sides had a chance to share common challenges in environment, finance, technology, urban and rural connectivity in the development process. Participants suggested creating more favourable conditions for youths to increase their involvement in political affairs and empowering youngsters and women to engage in political activities. They expressed hope to contribute their voice to the Government’s policy making in education and career orientation.